We all know Rush Limbaugh from his radio talk show, but what you might not know is that he has started his own book series called Rush Revere. 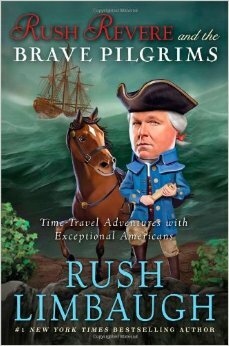 Book one is about as substitute history teacher named Rush Revere who has a horse from the 17th, 18th century. The horse (whose name is Liberty) got struck with lightning that somehow granted him the gift of speech and time travel. The lightning opened a time portal that sucked poor Liberty into the 21st century. Now along with two of Rush’s students, Rush, Liberty, Freedom, and Tommy race through time learning about history and the origin of America. If you have any requests for a book you would appreciate me writing about, please mail me at P.O. Box 304 Bolingbroke, GA 31004 or fill out this contact form below. I hope to read it soon. It really is such a good book!